If two Koreas march together at Olympics, what flag do they raise? With hopes rising for an inter-Korean thaw as North Korea plans to send its delegates to the PyeongChang Winter Olympics, South Korea is eager to figure out how to best leverage the sporting event as an opportunity to showcase its resolve to bring peace and stability to the Korean Peninsula. One of those ideas is to show the world the two Koreas’ delegates marching together in the opening and closing ceremonies of the Olympics -- an image designed to demonstrate the two Koreas are originally one country and that they long for a reunification. However, an unlikely debate has emerged among the people of South Korea: If the two Koreas reach an agreement on the idea of marching together, what flag do the two Koreas’ delegates raise during the ceremonies? In order to showcase the two Koreas’ solidarity, the Moon Jae-in administration and ruling Democratic Party of Korea said the delegates should raise a “Korean Unification” flag -- a white flag with the blue shape of the Korean Peninsula in the center -- not the national flag of either the two countries. “There is discussion underway. ... (But) If we agreed on marching together with North Korea during the opening ceremony, I think we will raise the Korean Unification flag,” Do Jong-hwan, minister of Culture, Sports and Tourism, told lawmakers Monday. The minister said that precedent exists. When the two Koreas previously marched together during international sporting events -- including the 2000 Sydney Summer Olympics -- they also then raised the Korean Unification flag in lieu of the national flags. But there are criticisms -- particularly from conservative and centrist opposition parties -- that such precedent should not be applied to the PyeongChang Olympics, which South Korea earned the right to host in 2011 following two unsuccessful bids. Throughout the history of the modern Olympics -- whether of the winter or summer games -- there is no precedent where the host country has not raised its own national flag during the opening and closing ceremonies. Even though there is no such previous case at the Olympics, Sports Minister Do said there have been cases where the two Koreas marched together under the Korean Unification flag during international sporting events hosted by South Korea. Among them is the 2002 Asian Games held in Busan when North Korea sent a massive group of delegates, including a large cheerleading squad. A year later, the two Koreas also marched together under the same flag when South Korea hosted the Summer Universiade in Daegu. “A massive Taegeukgi will be raised at the Olympics stadium during the opening ceremony and whenever South Korean athletes win gold medals,” the minister told opposition lawmakers, reassuring them the South Korean national flag would be raised during the Olympics period. Although it is still unclear whether North Korea had asked South Korea to raise the unification flag during the ceremonies, opposition camps questioned whether the move has been conducive to easing cross-border tensions on the Korean Peninsula. Liberal-minded politicians and activists assert the move has been helpful in building a sense of solidarity between the two Koreas, but conservative and hawkish politicians argue it has failed to prevent Pyeongyang’s relentless pursuit of nuclear weapons. “Every time North Korea sent its cheerleading squad waving unification flags, it made headlines. But we ended up with the North Korean nuclear and missile program,” said Rep. Kweon Seong-dong of the conservative Liberty Korea Party. North Korea conducted its first underground nuclear test in October 2006 -- eight months after the two Korea marched together under the unification flag during the opening ceremony of the 2006 Winter Olympics at Turin, Italy. 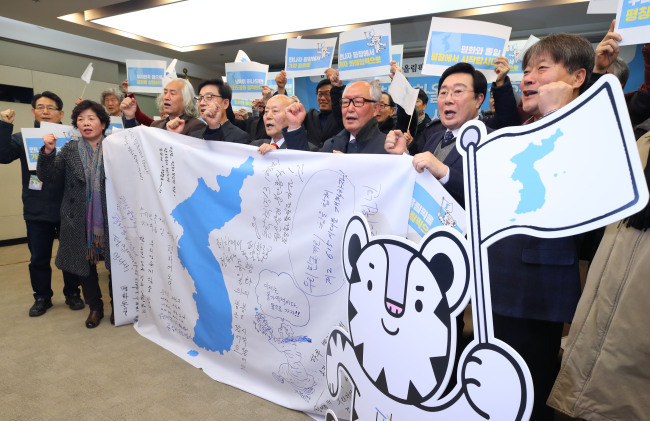 But liberal scholars and officials said that using the unification flag is probably the best way to represent Koreans’ unity if they do decide to march together, noting the flag itself is the outcome of the two Koreas’ negotiations. 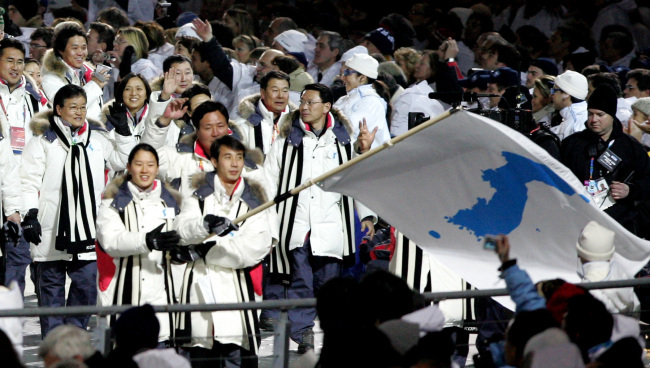 The North and South discussed what flag they would compete under when they pushed for a plan to create a joint team for the 1990 Asian Games in Beijing. Following a series of tough negotiations, they came up with what is now referred to as the Korean unification flag. It was first used at an international table tennis championship in Tokyo in 1991.